At Martin Dental, we believe in caring for our patient’s oral health for life, which means starting at an early age. We encourage families to visit the dentist with their kids on a regular basis from three years of age. Exposing your children to the dentist at a young age allows us to form a trusting and solid relationship. It also helps to reduce any dental phobias that may develop. The Children’s Dental Benefit Scheme allows bulk billed dentist treatment from two years of age for eligible children. So for those eligible patients, just bring your medicare card and we will take care of the rest. No upfront fees apply. Visit The Australian Government Department of Human Services to check your eligibility. We are a family dentistry practice and in most cases, we can treat all children in our surgery. This can save costly visits to Specialists or Paediatric Children’s Dentists. That means one dentist for all members of the family! We ensure to make your child’s visit to the dentist a positive one by providing and engaging a caring environment for dental education. With friendly and familiar faces and early education about oral hygiene, going to the dentist can be an enjoyable experience for children and continues to be a healthy habit through life! Be comfortable bringing all your kids along with our gated play area in our waiting room for your convenience. Rest assured knowing they are safe and entertained whilst they wait. Our young patients will also receive a small fun gift to encourage a positive dental experience with us. Visit our fun page for puzzles, games and colouring in competitions. 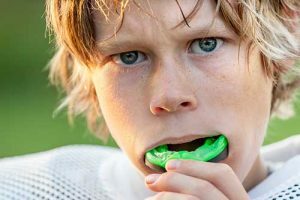 AFFORDABLE CHILDREN’S MOUTH GUARDS IN ALL TEAM COLORS! We provide custom-made, affordable adult and children’s mouthguards for all sporting activities. With health fund rebates available, affordable pricing and a range of team colours on offer, we have your mouthguard needs covered. Your skin is exposed to many internal and external factors that can affect its elasticity and general appearance. Things such as the natural ageing process, the sun and climate, as well as our own facial expressions can cause wrinkles and a reduction in elasticity. Cosmetic Injectables offer a surgical alternative to soften and reduce wrinkles and lines on and around your face. The team at Martin Dental are experts in the anatomy of the face, mouth and head with our extensive dental training. We continue this high standard of treatment when it comes to cosmetic procedures. We use a tiny needle to inject cosmetic injectables into the muscles to address your fine lines and wrinkles. Our cosmetic injectable procedures are quick and simple with no downtime. Make an appointment in your lunch break and then continue on with your day! Cosmetic injectables are used to address common pain issues located in the jaw, neck and head. They are advantageous for patients who suffer from debilitating migraines and TMJ disorders. Muscle Relaxers can provide immediate relief for TMJ sufferers as well as restoring normal facial expressions that may have been affected. To maintain optimal results, Martin Dental recommends that you keep up the treatment for TMJ every 3-4 months. Combining this with your regular check-up and clean is a great way to stay on top of your health. Your teeth depend on one another to eat and speak. Damage to one tooth may compromise the health of the others. Chewing may become difficult or your smile may change. A simple crown can restore your mouth and smile to its normal state. Cosmetically, crowns are a very popular choice as they can help achieve an amazing cosmetic result. A Crown is a strong porcelain cover that is placed on an individual tooth to restore a decayed or damaged tooth to its normal size. Occasionally, they can consist of gold covered with porcelain when a higher degree of strength is required. They are used when there is no longer sufficient tooth structure left to place a regular filling or to protect cracked or broken teeth. They can also be used to protect and strengthen teeth that have undergone Root Canal Treatment or to change the shape of your tooth to correct a bite or cosmetic problem, to replace an existing or a poorly fitting crown. Bridges fill gaps left by missing teeth that can dramatically improve your smile and your overall mouth function. It is now a very affordable option and can be performed under local anaesthetic. Dentures are a suitable option for those who have lost teeth to decay, gum disease or even trauma. They are the most common option to replace missing teeth with the aim to match your existing smile as closely as possible. As your teeth support your muscles, when you lose teeth, muscle droop may occur. Replacing the gaps from missing teeth with dentures can provide muscle support and delay further facial sagging. At Martin Dental, we aim to provide you with a denture that looks as similar to your natural teeth as possible. Dentures are a custom-made removable option to replace missing teeth and restore your smile. Dentures are artificial teeth and are generally made of carefully selected acrylic that best matches your natural teeth. The base of the denture is usually made from either acrylic or metal. There are two types of dentures, partial and full. The option you choose will be based on your number of missing teeth. If you only have a few teeth missing a partial denture may be suitable. On the other hand, if you have lost most or all of your teeth, then a full or complete denture will be the best option. We also offer immediate dentures to replace teeth as a result of an immediate extraction to have in place whilst tissue healing occurs. Not all extractions are suitable for immediate dentures so we can discuss with you if this treatment is suitable for your situation. It can take a little bit of time to get used to your new dentures. Often your new dentures will require a few adjustment appointments to ensure that they are comfortable and the perfect fit. Dentures are subject to wear and tear such as losing a tooth, having a chip or becoming loose through time and use as well as gum changes as you age. All are normal and expected. Often a simple denture repair is all that is needed. Depending on the amount of repair required, we may be able to offer you same day repairs which means less time without your dentures. This requires two appointments on the same day, one in the morning and one in the afternoon. We also offer denture relining which can extend the life of your current denture. Dental implants are a permanent fixed solution to a space as a result of one or more missing teeth. An implant is usually composed of a titanium screw that is placed into the bone of the location of the missing tooth. Once the implant is in place, our Dentists will complete the implant with a crown after a period of healing. The crown process is very similar to the process of having a crown placed on a natural tooth. Once completed, your implant will look and function as a normal tooth. Firstly, our dentists assess the area to determine if an implant is suitable which may require x-rays and scans to assess the amount of bone in the area. If the area is suitable, we refer you to an implant specialist who will place the titanium screw. You will then be sent home to heal before our Dentists complete the process with a tooth coloured crown. The process generally takes longer than dentures but the results are worthwhile. Taking care of your implant is the same as taking care of your natural teeth. Like natural teeth, the build-up of plaque and calculus can cause damage to the gums and bone around the implant. As implants are also susceptible to a form of gum disease, good oral hygiene and routine professional dental check-ups are important to ensure your implant stays healthy. Suffering from a broken tooth, toothache or lost a filling? We understand your dental emergency is a priority so we offer same day emergency dental treatment in our Mudgeeraba clinic to new and existing patients. Whether it be painful wisdom teeth, gum infections, sore and decayed teeth or just an irritating issue that needs immediate treatment. Simply call us and we will do our best to accommodate you as soon as possible. As a family practice, keeping our prices affordable is important to us. Therefore, you will receive the same rates as our regular dental appointments. There are no additional charges for emergency treatment. We understand dental emergencies happen at the least convenient of times. Our emergency dental care is available from 8:30am through to 6:30pm Monday to Friday with lunchtime appointments available. Hold the tooth by the crown (the white part) not by the root (the yellow part). Place back in immediately if possible. If the tooth is contaminated, rinse shortly with cold tap water and put the tooth back in place. Hold the tooth in place by biting down gently on a handkerchief. If you cannot put the tooth back into the socket, put the tooth in a cup of milk or saline. If milk or saline isn’t available, place the tooth between the teeth and gums. Call us and make an immediate appointment. Find the broken part of the tooth if you haven’t already swallowed it. Check if the gums around the tooth are bleeding and if so, call us immediately. If the area does not appear to be bleeding and the chipped part of the tooth is only minimal, phone us and make a future appointment as soon as you can. If you have lost a tooth or have any other emergency dental needs, put your mind at ease and call us for a same day appointment. In some instances, a tooth cannot be repaired. The best solution may be a full tooth extraction. Our team at Martin Dental are experts in tooth extractions including wisdom tooth removal. Wisdom teeth are the last teeth to come in and the ones least needed for good oral health. They generally develop from 17 years of age but can also appear later in life, or sometimes not at all. Our jaws are smaller than our ancestors so quite often we do not have sufficient room for our wisdom teeth to fit in our mouths. Problems can therefore arise when the wisdom teeth begin to develop. They can become compacted when they do not have sufficient space to come through and therefore grow in incorrect directions. This can then cause damage to surrounding teeth and removal of the impinging wisdom teeth is required. Our team is highly skilled in all extractions including Wisdom Teeth. If your Wisdom teeth present as a difficult extraction, we may refer you to a specialist dental surgeon. For those who experience anxiety with extractions, we offer Penthrox to help with anxiety and nerves. This effective and inexpensive form of sedation allows you to drive home after your visit as it is promptly removed from your system without any leftover grogginess. Laser whitening is the most advanced whitening system available today with quality results in just one visit. We use the latest laser technology combined with our safe and highly effective whitening gel. You’ll receive the best results possible, quickly and safely. Laser whitening differs to other products on the market such as the ‘Zoom’ whitening system in that it does not use UV Light. This means there is no risk of UV exposure to burn or blister the skin and gums. Say goodbye to the dreaded Dentist’s drill and say hello to our fast and effective dental laser! This generally pain-free form of dentistry means no need for anaesthetic which can be the main cause of dental anxiety for patients. Laser technology is not recommended for all fillings and restorations so we will advise whether Laser Dentistry is suitable for you at your initial consultation. It is important to catch and treat gum disease in its early stages. There can often be no outward symptoms, so we recommend regular visits with us to assess your mouth for any initial stages of gum disease. It is recommended by all major Health Authorities such as Australian Dental Association that routine 6 monthly visits to your Dentist are necessary to prevent and control gum disease. Gum disease has been found to have strong links with heart disease. The bacteria that cause gum disease can enter the bloodstream through the inflamed gums and attach to fatty deposits in the blood vessels of the heart. This condition can cause blood clots, which can lead to a heart attack. Due to this link, it is strongly recommended that you maintain healthy gums to prevent any effects it may have on your overall health. There is now also a link between gum disease and diabetes which in the past has prompted Federal Government funding for major Dental works programs for Diabetics. Diabetes is a systemic condition that changes the inflammation response of the body. Normally when plaque constantly sits on the gums they become inflamed. This is how the body reacts to the plaque. However, in diabetics, the over-responsive immune system combined with delayed healing can result in a higher risk of gum disease. This is more prevalent when diabetes has been present for a long time or if not controlled well. Gum disease can also be the cause of bad breath and tooth decay. Alongside this, it can be caused by a dry mouth due to dehydration or certain medications. Medications can reduce the amount of saliva that is produced by the mouth which is important for cleansing the bad bacteria that causes bad breath. There are some ways to manage a dry mouth including salivary substitute products we can discuss with you. Root canal treatment can be one of the most feared dental procedures by our clients. At Martin Dental, we are changing the face of root canal treatment and do everything we can to make our root canal treatment as comfortable as possible. Root canal treatment is performed to save a tooth when it is dead or dying and usually causing pain. The pain experienced can be quite severe, so we aim to treat the tooth immediately to alleviate your symptoms. The procedure treats disorders of the pulp, which is the soft tissue inside the crown and roots made up of blood vessels, nerves and lymph vessels that help keep your teeth nourished. Endodontic root canal treatments restore your tooth to a comfortable state by removing the damaged tissue and replacing it with a substance that will help preserve the function of the tooth. What Causes Root Canal Treatment? The most common cause of root canal treatment is decayed teeth or caries. When tooth decay begins, it penetrates the outer layer of enamel and creates a cavity. If that process is not stopped in its tracks the decay will continue towards the nerve of the tooth. This is when the problem occurs. Other causes can include fractures that expose the pulp or a traumatic injury such as a blow to the tooth or a loose filling. Regardless of the initial cause, the tooth pulp becomes irritated and an abscess (infection) can occur. Bacteria from your saliva grow within the pulp, causing pressure and immense pain. Eventually, the pulp dies causing the bone around the tooth to be destroyed. If not treated quickly and effectively, adverse effects of the infection can include a weakened immune system, bone loss, loss of chewing ability and digestive issues. Root canal treatment can seem scary and expensive. At Martin Dental, we aim to eliminate both of these concerns. Affordable pricing and appointments that can be spread over time make the necessary treatments much more affordable and reasonable. Have you woken up lately with sore jaw muscles, a headache or sensitive tender teeth? It may be a sign that you are grinding or clenching your teeth at night. It is a common problem for stressed adults. However, left untreated, grinding can lead to loss of tooth structure, headaches and sleep problems. Teeth grinding may be a result of stress as well as sleep apnea. Sleep apnea occurs when the airway is blocked during sleep and breathing stops for a period of time. Sleep apnea causes stress on the airway which in turn creates stress on the body, which leads to teeth grinding. If left untreated sleep apnea can cause other significant health issues such as loss of tooth structure. Over a period of time, you may notice your teeth appearing shorter as the height of the tooth has been worn away by grinding. A splint, also known as a night guard, can be created and worn to prevent further wear to your teeth. Creating a splint is a simple, 15 minute procedure where your Dentist takes an impression of your teeth. We then create a comfortable splint for you in our laboratory ready for collection. If a splint is not suitable, we can also discuss our cosmetic injectables as an alternative treatment. Cosmetic Injectables aim to relax the muscles in the jaw area to reduce the amount of clenching force. This can take the load off the teeth to reduce grinding symptoms. Your TMJ joint acts like a sliding hinge connecting each side of your jaw to your skull. TMJ disorder can cause pain in your jaw joint, neck and in your muscles that control jaw movement. When the jaw is injured or damaged localised pain occurs and pain can be felt in the ear as well as headaches. Causes of TMJ Disorder include injury to the teeth, misalignment of the teeth or jaw, teeth grinding, poor posture, stress, arthritis and gum chewing. TMJ can be treated in a number of ways including night guards, sleep guards and injectables that relax the muscles. Dr. Martin can customize a solution that suits your needs. Gone are the days of amalgam and silver mercury fillings. Dental composite restorations, otherwise known as white fillings or tooth coloured fillings, are used to restore a tooth that has been broken or decayed. Their white colour is used to blend into your existing teeth with minimal disruption to your smile. We use the latest and strongest materials to restore your teeth to their greatest aesthetic potential. With years of experience using non-amalgam white filings, we will place an aesthetically pleasing and long lasting restoration for you. We also offer an amalgam filling removal service for those requiring removal for both health and aesthetic reasons. We believe that mercury fillings should not be placed in your mouth and therefore advocate the alternative white composite filling. They are both a safer and more aesthetically pleasing option. So whether you have one or many mercury amalgam fillings, we can assist with a straightforward treatment plan. As we age, our adult teeth become darker due to changes in the mineral structure of the tooth. The enamel becomes less porous and phosphate deficient. Teeth also become stained and discoloured from bacterial pigments, antibacterial medications, smoking, coffee, tea and red wine. Martin Dental offers both in-chair teeth whitening and at-home teeth bleaching kits to restore your teeth’s brilliance. Whitening restores your natural tooth colour and bleaching whitens beyond the natural colour. There are multiple methods available including brushing, internal bleaching, bleaching strips, bleaching trays and laser bleaching. Martin Dental offers Laser Tooth Whitening, the most advanced in-surgery whitening system available today. This one hour treatment obtains maximum whitening results after just one visit. Laser tooth whitening involves applying a safe concentrated whitening gel to your teeth. The laser then opens receptors within the tooth allowing for maximum whitening results. This is a pain-free in-chair procedure, although some patients may experience a small amount of sensitivity afterwards this usually subsides quickly with minor pain relief such as Panadol. Our effective and cost-efficient home bleaching system allows you to bleach your teeth in the comfort of your own home. Choose from a personalised tray that lasts for up to 10 years or our new disposable bleaching system which is thrown out after a single use. All of the teeth whitening products that Martin Dental offer are guaranteed to be safe for your teeth. We only use trusted brands that have invested extensive research into providing safe and effective whitening products. If any sensitivity does develop, it generally subsides quickly and has no detrimental effect on your teeth. With all the exciting changes pregnancy brings, pregnancy oral care is one that can fall to the bottom of the list. Looking after your teeth and gums whilst pregnant is an important part of your pregnancy health regime. Pregnancy causes hormonal changes that increase the risks of developing gum disease, otherwise known as pregnancy gingivitis. Gum disease is not only unpleasant for mum but can harm your unborn baby. Research has also shown a link between premature birth and periodontal disease, a chronic gum infection. Statistics suggest 18 out of every 100 premature births are triggered by periodontal disease. It can result in premature babies with eyesight, hearing issues and in the worst cases, cerebral palsy. Luckily, maintaining good oral hygiene will ensure you have healthy gums and teeth during pregnancy. If possible, make a dental appointment prior to falling pregnant. This way, you can undergo any work prior to your pregnancy. Your teeth can be professionally cleaned, gum tissue carefully examined, and any oral health problems can be treated in advance. That way, your body can concentrate on growing a beautiful healthy baby. Most routine dental care can be performed during pregnancy. However, you may need to postpone some elective or major dental procedures until after delivery. This may cause undue, prolonged discomfort throughout your pregnancy. For those mums who suffer from morning sickness, it is important to rinse after every episode to avoid dental erosion. The gastric reflux that travels up from your stomach can wear away at the enamel that covers and protects your teeth. Brushing straight after morning sickness can contribute to tooth loss. Therefore, we recommend rinsing your mouth thoroughly as opposed to brushing. It may also help to change your toothpaste to an unflavoured brand.